ALL ELEMENTS WANT TO BE LIKE THE NEAREST NOBLE GAS! What does this mean, anyway? A somewhat longer version of the octet rule is this: All elements will perform whatever chemical processes are necessary so that they have the same number of valence electrons² as their nearest noble gas. If they need go gain electrons so they have this number of electrons, their chemistry will be dominated by this need to gain electrons. If they need to lose electrons to be like the nearest noble gas, their chemistry will be dominated by the need to lose electrons. You may believe that fluorine is happy this way because he has the same number of protons (9) as electrons (9), making him electrically-neutral. However, if you think back to the periodic table section, you’ll remember that the noble gases are really really stable. This stability comes from the fact that they’ve got a filled valence shell, and all of the other elements want to have a filled valence shell like the noble gases, too. Upon gaining one electron, the fluorine atom becomes a flouride ion.⁴ Because fluorine is way more stable when it gains that one extra electron to be like neon, fluoride ions tend to be fairly unreactive. Similarly, lithium atoms can either gain seven electrons to be like neon or lose one to get the electron configuration of helium. As you’d expect, it loses one electron to become a lithium anion. Just as in the case of fluorine, the lithium ion is much less reactive than elemental lithium. One of the cool things about the periodic table is that you can use it to figure out the properties of elements. The properties that change in a systematic way as you move either across a row in the periodic table or down a group are called periodic trends. An important note: Periodic trends are just that: Trends. They’re not laws that are written in stone, and there are exceptions. However, you’ll find that these are extremely good guidelines for figuring out how things behave. As you move left to right across the periodic table, the atomic radii of the elements decreases. This is because the nuclei of these elements pick up more protons as you move across the table, while the energies of the electrons stay the same.⁷ Since the nucleus can pull harder but the electrons have the same energy, the electrons get pulled closer to the nucleus, making the atom smaller. As you move down a group in the periodic table, the atomic radius of the elements increases. That’s because the electrons are in higher energy levels, which puts them into bigger orbitals. Not surprisingly, bigger orbitals = bigger atoms. If you knock electrons off of an atom or add electrons, the resulting atom is referred to as an ion. Cations are ions with positive charge⁸ and anions are ions with negative charge.⁹ Generally, adding electrons to an atom it makes it bigger, while removing electrons makes it smaller. Assuming your friend wasn’t overcome with chemical fumes, he¹¹ would find that after adding some energy, an electron would come off of the atom forming a cation. The ionization energy of an element is the amount of energy it takes to pull one electron off of an atom. 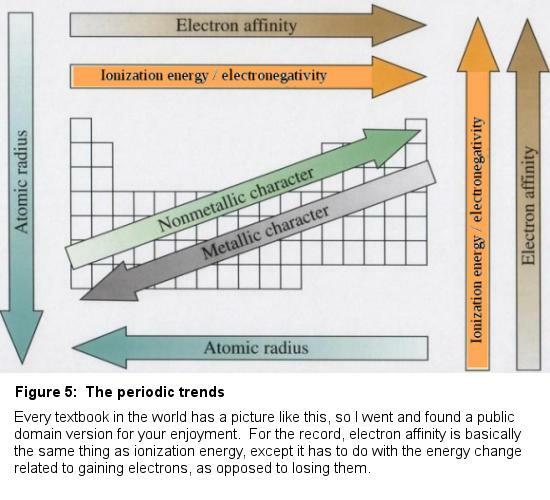 As you move left to right across the periodic table, the ionization energies of elements increase. Consider this: Elements on the left side of the periodic table want to lose electrons because their nearest noble gases have fewer electrons than they do. As a result, it doesn’t take much energy to make this happen. Elements on the right side of the periodic table want to gain electrons to be like their nearest noble gas, so it takes a lot of energy to pull off electrons. Video: Octet Rule and Valance Charges – Clear and Simple, from Sciencepost. Even though he misspelled “valence”, it’s still a really good video. Video: Ionization and Electron Affinity, from Crash Course Chemistry #5. Video: Periodic Trends, by Chemistry 3.3, IsaacsTEACH. Video: Periodic Trends, by Musical MCAT. Believe it or not, this will help a lot with keeping the trends straight. 1. I honestly believe this to be true. If you learn how the octet rule works, you’re well on your way to being a better chemist than many I’ve worked with professionally. 2. A reminder: Valence electrons are the electrons in the outermost energy shell of an atom. They’re the ones that are responsible for the making and breaking of bonds we see when reactions occur. 3. This -1 charge is found by comparing the number of protons (9) to the number of electrons that fluorine has when it gains one (10) – this extra electron gives it a -1 charge. As a rule, atoms get negative charges when they gain electrons and positive ones when they lose electrons. 4. More specifically, an anion. Anions are atoms or groups of atoms that have negative charge, while cations are atoms or groups of atoms with positive charge. 5. One compound that contains lithium ions is lithium stearate, which is used as a grease because it’s so stable under a variety of conditions. On the other hand, pure lithium has to be stored under oil because it will react with the tiny amount of moisture in air. 6. “pm” stands for “picometers”, or one-trillionth (10⁻¹² m). 7. Remember, elements in the same period have nearly identical orbital energies. 8. i.e. they lost electrons, so have more positive charge than negative. 9. i.e. they gained electrons, so have more negative charge than positive. 10. I’m guessing the smell would make you puke. 11. I’m assuming your friend is male in this case, because women are usually too smart to pull dumb stunts like this one. 12. If you add enough energy, it’s possible to knock more than one electron off of an atom. As a result, you can have multiple ionization energies for the same atom (“first ionization energy”, “second ionization energy”, etc.) Each electron takes more energy to remove than the one before, so the first ionization energy of an element will always be lower than the second (and so forth). This is particularly true if you’re trying to pull electrons away from an element that has the same number of electrons as its nearest noble gas. For example, it takes only 522 kJ/mol of energy to remove one electron from lithium (which gives it the same number of electrons as helium), but 7,301 kJ/mol to remove a second (which takes it away from its happy helium configuration). Yet again, the octet rule is the cause of something amazing. 13. Because of the octet rule. 15. Though most numbers in science have units associated with them (cm, kg, etc. ), electronegativity values are just plain ol’ numbers that indicate how much pull each element has. The most common of these scales is the Pauling electronegativity scale. Named after two-time Nobel laureate Linus Pauling, the concept of electronegativity is only one of the incredible things this dude discovered. Seriously, Pauling was badass. 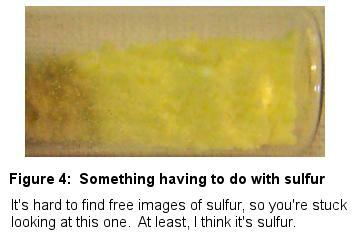 Sulfur: Paginazero, CC BY-SA 3.0, accessed on Wikimedia Commons. This webpage and the related worksheets are licensed under the Creative Commons Attribution-NonCommerical-ShareAlike 4.0 International license (CC BY-NC 4.0). For more information about this license and how it affects how you can use the contents of this site, click here. For those of you who need to cite this using incorrect methods such as MLA, APA, and Turabian, it was written by Ian Guch on December 2, 2014. If you’d like to cite this page correctly using ACS style, click here.